Heading into 2018, Orangeville Mayor Jeremy Williams is looking back into the past three years while also planning for the last year of his first term and a bid for a second four-year term. The next election is just a year away, so Mayor Williams has some choices to make. In an interview, he explained how the recent years have affected the community and himself, and why he will be running again. Mayor Williams easily volunteered that the contribution he has made for the community that he is most pleased with is the Five-Year Budget Plan, because he feels it will have a great effect on the town. Mayor Williams also mentioned the median on Broadway and how it has won multiple awards, something for which he is very proud. Even though it has done so well, they are considering updating it – not tearing it down or doing big renovations, but possibly trimming the trees, and making it look more modern. One of the streets the Mayor speaks about closing is already closed most of the yearon Saturdays for the Farmers Market, so closing it permanently is not likely to have a big impact on traffic flow. Events that could be held in a place like this could be for holidays, like Canada Day or a countdown for New Year’s. There could also be local fundraisers, or anything that would benefit the community. He says that for those in Orangeville who appreciate the arts, a gallery would be a great place for them to go and see what others in our community are creating. More support for visual arts in Orangeville would be a great addition to the town. 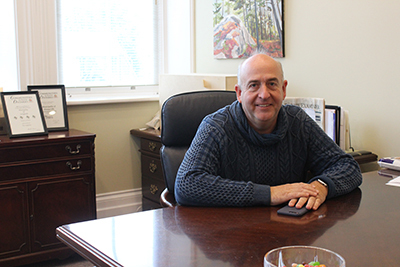 “This might sound cheesy, but my favourite part about being mayor is meeting people like you, people in the community that want to get involved and care about the community.” Mayor Williams says he is always happy to start a conversation with anyone, and wants to really get to know the people within Orangeville.